The Independent National Electoral Commission (INEC) has been advised to ensure it conducts credible elections in 2019 so as not to plunge Nigeria into crisis capable of threatening the peace of the nation. 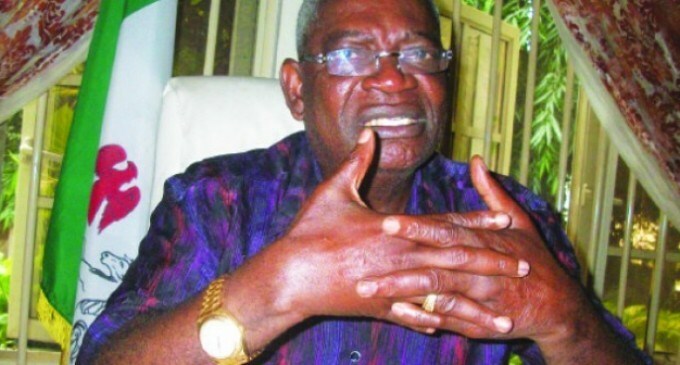 Giving the advice in an interview with Saturday Sun, elder-statesman, and prominent All Progressives Congress, APC chieftain, Senator Joseph Waku, implored INEC officials and security agencies that will take part in the polls to discharge their duties without fear or favour. In this interview with TUNDE THOMAS, Waku also spoke on other issues, including the contest for control of his Benue home state. He described former governor of the state, George Akune as a betrayer of his people. Former governor of Benue State Senator George Akume is currently in the eye of a storm as prominent indigenes, including Governor Samuel Ortom and Dr Iyorchia Ayu, have been lambasting him over comments he reportedly made last week while leading a delegation of Benue State leaders to President Buhari that the state government has a hand in the ongoing killings in the state, whatâ€™s your reaction to that? Akume is a betrayer. He has always been a betrayer of Benue people. He claimed to be from Benue State but his actions, utterances and behavior are always anti-Benue. George Akume is a Judas. As Judas Iscariot betrayed Jesus Christ in the Bible, Akume is our own Judas in Benue State. Although that statement he made accusing Benue State of being behind the killings in the state is very unfortunate and reckless but Iâ€™m not surprised because George Akume I know very well can betray anybody. He can even sell his own mother. This is one of the reasons why Akume always fell out with those people he supported to become governor. That was why he fell out with Gabriel Suswan when Suswan was the state governor. He also fell out with the current state governor Samuel Ortom, and thatâ€™s why he has been trying to run Ortom down. Benue people have no regard for Akume because we all know that he always stand against the interests of the people. You said Senator Akume has always been betraying Benue people, were there instances of such betrayal in the past? Yes, Akume has betrayed us on several occasion. Look at the time those herdsmen attacked and killed several Benue people in Agatu community, when there was worldwide condemnation over the attack, Akume didnâ€™t utter a word in the Senae to condemn the attack, and yet Akume claim to be representing Benue State in the Senate. At the height of that crisis when the whole world was condemning the massacre in Agatu community, it was only Senators David Mark, Dino Melaye and Shehu Sani that rose in the Senate to condemn the attack in strongest term. Those close to Akume that day told some of us that he was certainly drunk that day as he was not coherent and coordinated. Iâ€™m very sure that last week when Akume made that statement in Aso Rock he must as usual have been under the influence of alcohol. Otherwise if a man is not under the influence of alcohol, how can he made such reckless statement. Even President Buhari was reported to be shocked when Akume made that embarrassing statement. Then why would Buhari not be shocked? The president must have been shocked because he himself has said on several occasions and at several fora that those behind the killings in Benue State are terrorists from Gaddafiâ€™s Libya, even though millions of Nigerians believe and also know that herdsmen are behind the killings in Benue State. Akume should not be taken serious by anybody. He made that statement probably to please Buhari but the President himself was shocked. I was told that people there were all embarrassed by Akumeâ€™s remarks. Nigerians should not take Akume serious. He has never been a coherent person. How do you want Nigerians to believe that considering the fact that Senator Akume was Benue State governor for 8 years and has also been a serving senator for 8 years? This is what many Nigerians donâ€™t know. Akume was an accidental governor. He was not to be made governor of Benue State governor if a lawyer that had initially been penciled down for the post have not had a life threatening accident which confined him to a wheel chair, but the man had even passed away. It was out of sympathy for people from that lawyerâ€™s area where Akume also hailed from that made the decision to be taken that Akume should be picked as a replacement. Former Senate President, Dr Iyorchia Ayu was among those prominent people who persuaded us to pick Akume. One of the reasons for opposing Akume was this his love for the bottle. He canâ€™t keep away from it, and anytime he is under the influence of alcohol he misbehave, and that was what exactly happened last week when he spoke at Aso Rock. From reliable information I also gathered, Akume at a point left presidential delegation to go and look for somewhere to drink when he accompanied President Buhari on a state visit to China recently. Such a man should not be taken serious. If Akume tell you something in the morning, by evening time, he canâ€™t remember again, and he would be saying another thing. Iâ€™m not disparaging him, this is a fact known to many people, and this was one of the reasons why he missed becoming Senate President narrowly. On that day on the floor of the Senate, while some of us were mobilizing support for him, Akume eventually disappointed us. When it was time for Akume to make presentations, to sell himself on why he was the best candidate for the job, he flopped. It was when questions was being asked him that Akume disappointed all of us. He was asked when he completed his tenure as Benue State governor, but to the shock and embarrassment of all of us, Akume said he completed his tenure as Benue State governor in May 1977, what a blunder. A man that just left office in 2003 was telling Senate 1977. That was how Akume shot himself in the leg and those of us who were mobilizing support for him were thoroughly embarrassed. My advise to Nigerians is that they should ignore Akume, and also I want to appeal to President Buhari to be careful with Akume. Akume may just wake up one day and say that it is Buhari himself that is sending Boko Haram insurgents to kill our soldiers. Whenever Akume is under the influence of alcohol he can say anything. But some people are saying that since there were other eminent people from Benue State in that delegation including Major General Lawrence Onoja, and Chief Paul Unongo that Akume would probably have been speaking what was collectively agreed upon by all members of that team, whatâ€™s your take on that? Although I canâ€™t speak for Chief Unongo and Gen. Onoja who I admire and respect a lot, but one thing Iâ€™m very sure of is that Akume conscripted the two men into his delegation. If it was a normal visit, the delegation would have agreed on the speech to be delivered. That speech would have been vetted. But Akume spoke without any prepared speech. Unongo and Onoja are brilliant minds, Iâ€™m very sure that Akume conscripted into the delegation. Who is even Akume to lead Benue delegation? Akume is nowhere near Benue State best 11. Under normal circumstances he canâ€™t lead Benue delegation. Benue State governor, Samuel Ortom has threatened to report Akume to Tiv Traditional Council over his accusation against the state government, how do you see that? It is a welcome development. Akume should be made to prove his baseless allegations. He should be sanctioned for his anti-Benue people activities. If not for civilization, Benue people would have ex-communicate Akume over his reckless statement on the killings of Benue people. He would have been banished from Benue State. Since all government security agencies have been carrying out investigations into these killings, no Benue indigene has been indicted or linked with the killings. So Akume should be made to prove his baseless allegations. Benue people are going to recall him from the Senate over this issue. We are tired of Akumeâ€™s series of acts of betrayals. We thank God that Akume didnâ€™t become Senate President, otherwise he would have become a big disgrace to Benue people. Like I said earlier, we are going to start his recall from the Senate very soon. Akumere has never been an asset to Benue State. He has no business investment in and out of the state. His only business is politics, and he has been using that politics to destroy his own people. Recalling Akume back from the Senate is a good riddance to bad rubbish. The national chairman of APC, Comrade Adams Oshiomhole and members of APC NWC had threatened to impose sanctions on any aggrieved party member who drags the party to court, whatâ€™s your take on that? It is very sad and also unfortunate that Oshiomhole had short memory. How did he become state governor in Edo State? If he had not gone to court, he wouldnâ€™t have become governor. He went to court because he felt then that he had been wronged, and it was through the judiciary that he got justice. Having been a beneficiary of the judiciary, is it right for Oshiomhole now to be telling others not to go to court? I have said it earlier that Oshiomhole is an undertaker that had come to bury APC. I said it a long time ago, but now recent events in APC are proving me right. Some of these people parading themselves as democrats in APC are anti-democracy elements. They are autocrats. President Buhari who is a retired General is even a better democrat than many of these people. We should give kudos to Buhari. He is the one that has been stabilizing our democracy. Look at the way he allowed due process to take place during the governorship election in Anambra State. He was firm with INEC and the military and the Police, and there was no manipulation and compromise. But look at what happened in Osun State when Buhari was not in the country. INEC and the military including the police messed up in Osun State. Integrity of INEC and the security agencies were compromised in Osun State. INEC has to watch it in 2019. Are you saying that INEC didnâ€™t live up to expectation in Osun State during the governorship election there? INEC didnâ€™t live up to expectation at all. International observers spoke out against INEC and the security agencies. In 2019, INEC should watch it. INEC has to buckle up. The INEC chairman and other officials should not compromise their integrity. If INEC mess up in 2019, Nigeria will be in grave danger. INEC should not be partisan. Although President Buhari is fair minded, but some individuals like George Akume in Benue State have been boasting that he will use federal might to capture Benue State in 2019. Akume and others in his shoes should be called to order. There is danger ahead for this nation if people like Akume are not checkmated. President Buhari is a man of integrity. In 2019 he should not let some unpatriotic elements mislead him. Buhari should think of Nigeria first. The will of the people should be respected. Peopleâ€™s votes should count.